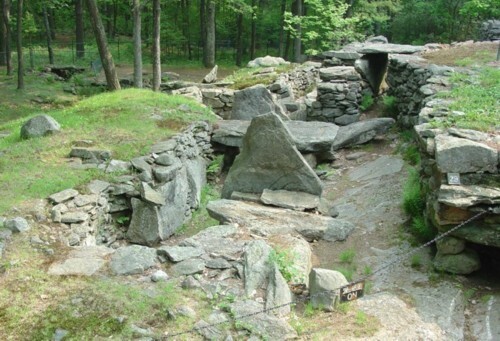 The Mystery Hill archaeological site, better known today as America’s Stonehenge, is situated on the exposed bedrock summit of Mystery Hill in North Salem, New Hampshire. The site consists of a core complex of 13 stone chambers, several enclosures, niches, stone walls, stoned lined drains, small grooves & basins, and other features which covers about one acre on the summit. Extending outward from and surrounding the core complex, are more stone walls, niches, standing stones, and two procession ways. Along the perimeter of the summit are four confirmed astronomical alignments. Below the summit on the slopes of the hill are a 14th chamber, two utilized natural caves, springs, stone walls, stone cairns, niches, standing stones, and other features. In total, the site covers about 105 acres. America’s Stonehenge is not unique. Throughout northeastern United States and southeastern Canada, there are thousands of archaeological sites with stone cairns, niches, enclosures, standing stones, and other types of structures. Over 500 of these sites contain stone chambers. Astronomical alignments have been confirmed at some of these sites as well. America’s Stonehenge stands out amongst all of these others sites because it is arguably the most complex, sophisticated, and visually impressive of all the known stone structure sites in Northeastern U.S.
An impressive number of carbon-14 dates have been obtained from charcoal samples found during excavations at the site. These dates range from 7,000 years ago to as recent as 200 years ago. The earliest c-14 date which is directly linked to construction activity on the site is 2995 BP or about 3,000 years ago. C-14 dates and some artifacts found at the site suggest continued activity at the site into the early historic period just prior to white settlement of the region. Conservatively speaking, there is evidence of continued human presence related to the stone structures at the site for a 2500 year time period. Detailed archaeological and architectural analysis of the structures suggests the site went through five cultural phases each with its own distinct architecture. Rather than being built as single large scale construction project, the site evolved through multiple building episodes that expanded, modified, and upgraded it. A number of theories have been advanced in 70+ years since the first systematic investigation of the site in the late 1930’s. William Goodwin, the first investigator of the site, theorized it was built by Irish Culdee monks around 1000 AD. Hugh O’Neill Hencken, a curator with Harvard’s Peabody Museum, quickly countered Goodwin’s argument by stating the site was built by Jonathan Pattee who lived on the property from 1825 to his death in 1849. Barry Fell in his famous (or infamous) book America BC (1976) argued the site was built between 800 and 600 BC by Goidelic Celtics. In recent years, the theory that the site was built by Native American peoples has gained creditability in the ongoing debate over the site. 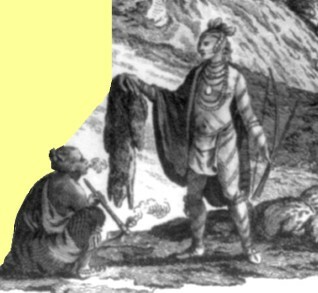 The Native American theory was formally published in Mary Gage’s book America’s Stonehenge Deciphered (2006). The proposed purposes for the site’s construction are as varied as the theories of who built it. Interesting enough, with the exception of the arguments that the site was built by Jonathan Pattee, all of the explanations for the purpose of the site have revolved around the concept of the place as a religious or ceremonial center.